The grapes are picked at optimum ripeness at approximately 25 °Balling (Brix). After destemming and slight crushing the mash is taken to stainless steel tanks for fermentation on the skins. Cold soaking is done for 2 days or until the fermentation starts naturally when after cultivated wine yeast is immediately inoculated. During fermentation the temperature is controlled between 25-28 °Celsius and the cap wetted every 2-3 hours by means of pumpovers and a process called delastage twice a day. This allows the colour and flavour to be extracted very effectively from the skins. The must normally takes 5 days to ferment dry. Another day is then allowed for additional skin contact before racking and pressing. French oak is then introduced to the wine in the form of staves in stainless steel tanks for malolactic fermentation and maturation for at least 6 months. 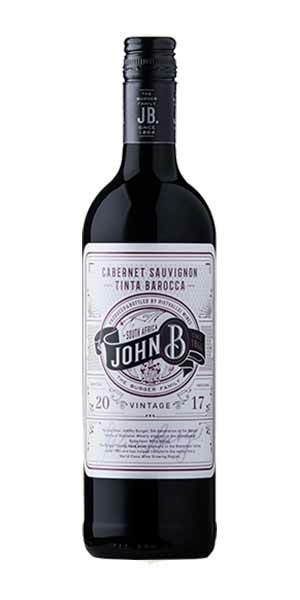 This is a blend of 55% Cabernet Sauvignon and 45% Tinta Barocca. A wine with lots of attractive berry fruit flavours on the nose and which also carries through nicely on the palate with a hint of spiciness. It is smooth and well balanced with a touch of toastiness and lingering aftertaste.